Around the wider world of golf: Things are still just in the "getting cranked up" stage this season. Miguel Angel Jimenez won the Mitsubishi Electric Championship at Hualalai on the Champions Tour, and Branden Grace won the Commercial Bank Qatar Masters on the ET. Bill Haas didn't win any tournaments last year, the first year that's happened since he got his first win in 2010 -- which, ironically enough, was at the former 5-round event called the Bob Hope Classic. You know it these days as the Humana Challenge. The reason for Bill's lack of production can be blamed on a wrist injury he got at the RBC Heritage in April last year. He didn't take time off to recover, although doctors told him he would eventually be forced to do so. Finally, after a lost 2014, he decided to bite the bullet and get well. But he didn't expect to play very well at the Humana. Seems that his game was a bit flat when he hooked up with his teacher Billy Harmon and his dad Jay the week before. Didn't look that flat, did it? Bill managed to work his way to the top of the leaderboard Saturday evening, and his scrambling on the final hole Sunday -- especially that bunker shot on 18 that looked more like a baseball swing -- seemed right on the mark. 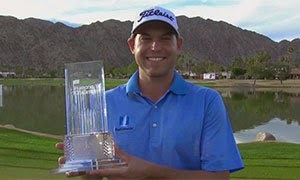 So Bill not only has a Bob Hope Classic win, but a Humana Challenge win as well. Of course, this is the last time Humana will be the event sponsor. Wonder what it'll be called next time he wins it? Whatever they call it, I call this win deserving of a Limerick Summary. Bill now has six PGA Tour wins... and he has a Limerick Summary for each. What a fortunate young man! Bill sure likes the desert a-plenty! So next time? Should be Twenty-twenty.